Herberger (1562-1627), a Lutheran pastor in Fraustadt (now Wschowa), Poland, at the turn of the seventeenth century, preached through the books of the Old Testament from Genesis through Ruth, producing devout meditations on the Scriptures. "These he regarded rather like the linen cloths that wrapped the infant Jesus in the manger, and traced his Lord in every little wrinkle" (from the translator's preface). In our day so starved for a religion of the heart, Herberger opens up the contemplative study of the Word of God so that it becomes for us a word of life. He preached in an age full of change and trouble, an age that yearned for something more than the power of positive thinking.... The Christian Church has had a lot of great preaching-the sort of preaching that is indeed a means of grace. 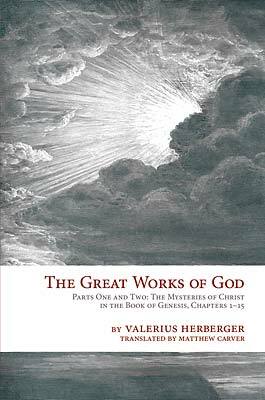 The Lutheran pastor and hymn-writer Valerius Herberger was known as the "Jesus Preacher" in his day, and this focus is quite evident in his very readable commentary on Genesis. Divided into 178 Meditations, each headed "Jesus...", it combines thorough familiarity with the Hebrew language and Bible history with practical applications filled with a warm awareness of the Savior's presence in the Christian's life. Along with abundant connections between Genesis and other passages, there is a ceaseless flow of reflections on Biblical references and Old Testament Messianic hope.Herberger was also called "the Little Luther," and one is indeed reminded of the Reformer's lively style in the warnings, comforts, anecdotes, humor, and Old Testament Christocentricity, while the interspersed petitions bring to mind Bengel's Gnomen. The translator has shed much light on Herberger's thinking and allusions in his renditions and annotations. It will be found a rich and delightful resource for sermons and Bible classes as well as private devotions. Pastor Valerius Herberger (1562-1627) served St. Mary's parish church in Fraustadt (now Wschowa) Poland during the most difficult days of the Counter-Reformation when a royal decree ousted the congregation from its building in 1604. As a deacon and preacher in the congregation for nearly forty years, Herberger left us a remarkable example of biblical interpretation, application, and sincere devotion. Matthew Carver, MFA, is a translator of German and classical literature. He resides in Nashville, TN, with his wife Amanda, where they pursue interests in art, orthodox Lutheran theology, liturgy, and hymnody.